Hey Can you Have a Guitar Tutorial Of (Let Her Go by Passenger)? Please Please. I Want That Song. PLss Tutorial po sa Let me be the one plss lng poo ! pwd po mag request ng toturial ng Porque pls po, tnx! Idol, pwede pa request ung Akin Ka Na Lang by JM De Guzman. Nahihirapan ako dun sa mga ibang covers baka pwede pagawa nmn ng tutorial, idol. BoogieBoy36, Request ko po ang Dear Classmate by Mayonnaise. Para pong napakinig ko na sa Channel nyo sa Youtube pero di pa po publish. Pa post na lang po. Maraming salamat bro. REQUEST KO POH AKO NG KANTA.SIKAT POH TALAGAH ITO PROMISE. KUNG GUSTO NIYONG LUMAWAK PAH ANG KASI-KATAN NINYO, GAWIN NIYO TONG KANTA NATU. thinking out loud By ed Sheeran..! astig tutorial nyo .!! ang dali ko lang natutu..!! Chivalry is Dead by Trevor Wesley . Tutorial po. Tutorial po ng "Sa Tuwina - TJ Monterde"
REQUEST POH AKO NG KANTA.SIKAT POH TALAGAH ITO PROMISE. Hi, it is really great list for playing with guitar. But could you please rearrange it as beginners can follow step-by-step. I think it is good if the beginners know what is need to play first. Sir Boogieboy36 Guitar Tutorial po ng ''Muling Magkalayo'' Please Po Lizquen po ang nagkanta niyan Please Gustong Gusto ko po talaga yang kanta na yan. 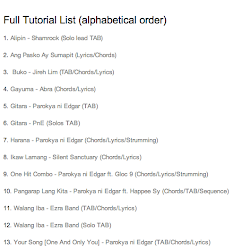 sir boogie yung paalam na ng silent sanctuary please yung susunofd na tutorial pls.. I really appreciate your work and very amazing and important information about the acoustic guitar for beginners which have share in this blog. 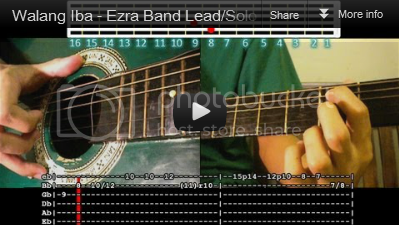 Hi guys, I just wanna share this amazing software that can help improve your guitar playing. I've been using it for quite some time now. It's very easy to use and at the same time it's a lot of fun. I hope this helps . Enjoy. Keep rockin'. "Kung Ako Na Lang Sana" yung pipiliin nyo sir.